One of the up and coming personalities in the pipe carving sphere is Josh Thompson. Josh is a working guy who lives in the gorgeous state of Hawaii doing what he loves: just living life. After encountering some of his work online (and being quite impressed I should add) I emailed Josh asking if we could have a conversation. What follows is the dialogue between me and one of the best, but lesser known, pipe carvers in the world. Well, I sure am glad to finally have gotten in touch with you. I know that we are about 4,600 miles away; so what time is there? It’s only 8:30 right now, so it’s not too early. Perfect time for a lazy Saturday cup of coffee and morning pipe. Sounds great, so let’s get started! I grew up in western Colorado, Grand Junction area. My dad lived around the Aspen area, so those are the two places that I spent much of my early life. I had a friend who lived on Kauai that I met during high school. He wound up in my school because of hurricane Iniki. I also had a cousin who had decided to move to Hawaii. My cousin offered me a job over here installing carpet, so I made the move in 2003. I completely fell in love with Maui and I just stayed out here. I ended up getting a few other friends to move over here to Maui, for it is a better economical center than other Hawaiian islands. Let me tell you too man: the people here in Hawaii are great. I love the lifestyle, the environment, and the people. These are just some of the happiest people you will ever meet. For most of us Hawaii is kind of a foreign place. 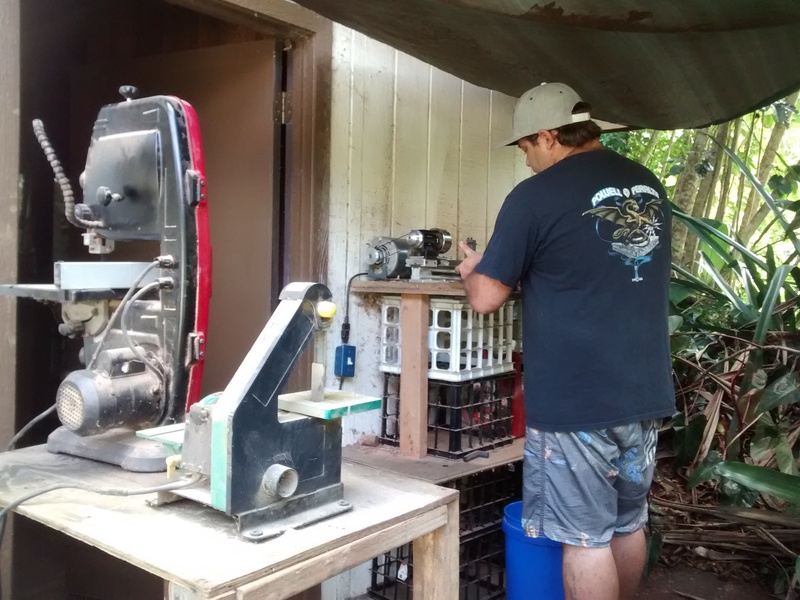 Is there a decent pipe and tobacco culture in Hawaii? There is a little bit over in Oahu. They have a pipe club over there. There are also a couple tobacco shops. Here on Maui I have never actually even seen another pipe smoker. We do have a small tobacconist here with less than 10 Savinelli pipes, and some Lane tobacco. The vast majority of my pipe smoking supply comes from online. So other than pipe making, what exactly do you do? Well, I work full-time as a house painter. We typically take care of high-end, custom homes, but I have painted just about everything by now. Right now I am maintaining a property that was built in the 1920’s and the whole of that estate. Other than work, I am really into skateboarding. I used to enjoy it more in my earlier years, but now that I am 37 my joints tend to keep that from happening! I also really enjoy hiking. I occasionally go shore fishing for ulua. I just love enjoying Hawaii. 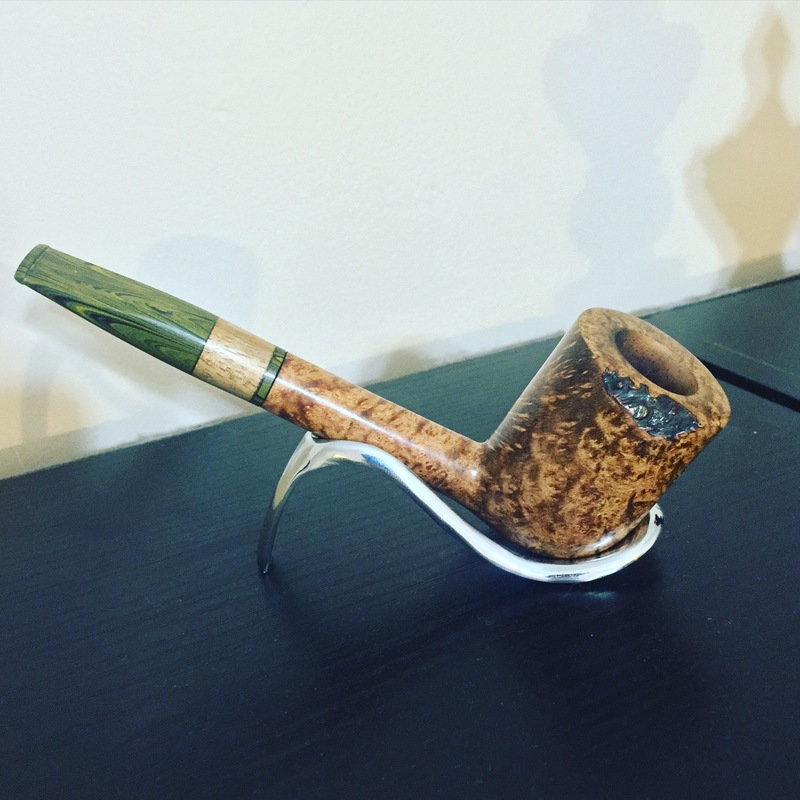 How did you get into the hobby of pipe smoking? Well that is kind of connected to your last question. As I was moving out of old hobbies, like skateboarding, I needed a new hobby. So pipe smoking just kind of filled that gap. One day I was carpooling with my boss on the way to work and we stopped by this little tobacco shop. 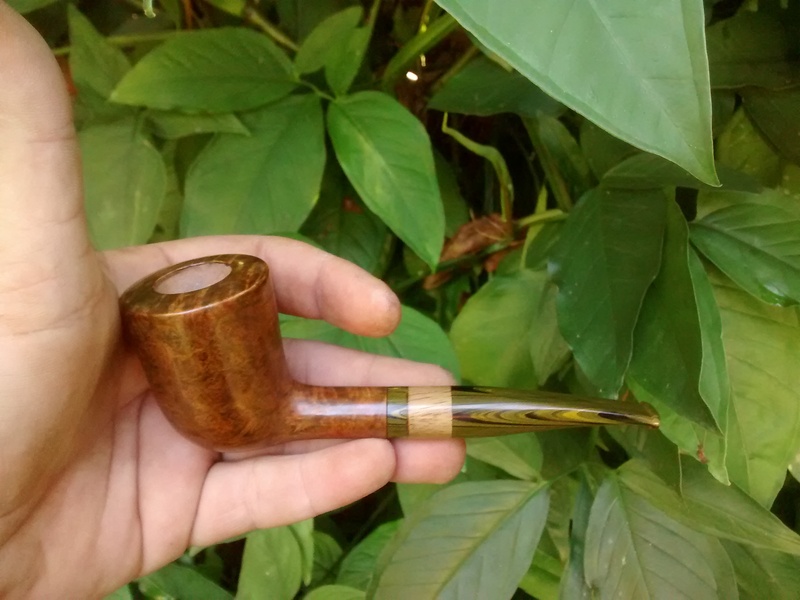 I ended up buying myself a Savinelli pipe for about $130. And from there it’s history. And funny story about that morning: while I was holding that pipe, my boss leaned over and said, “well you can make one those, can’t you?” As I think back on that moment I laugh pretty hard! What inspired you to begin making tobacco pipes? I started watching youtube videos on how to carve pipes. I knew I could use all my painting and staining experience to help me as well. I just wanted to make great pipes; just like the ones I was seeing online from makers in Europe. How long does it take you to make one pipe? It really depends on the pipe. 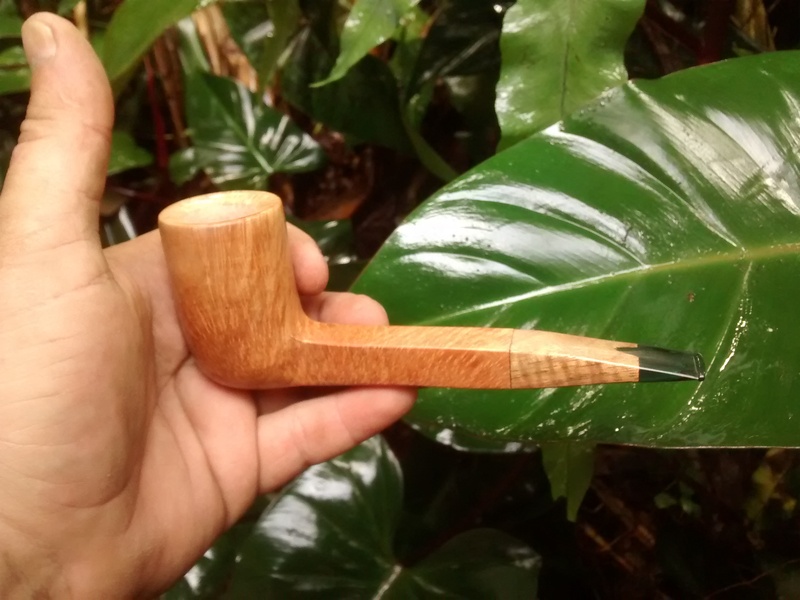 On average I take about two or three days to make a pipe. Because of work I am generally limited on how much time I would like to spend on a pipe. My workshop is actually completely outside, so once it turns dark it is impossible for me to work. If I put up lights I get mobbed by mosquitoes! What process or theme do you use when designing your pipes? I like some of my rustication to look like lava rock. I try for Textures and colors that look like Hawaii. I try to build my stems to match. I love using local hardwood instead of metal in the stem. I really love using Japanese ebonite for the stems, since Japanese culture is a big part of today’s Hawaiian life. I am looking at getting into some new materials as well. What do you want people to know about your pipes? I am just a guy trying to make affordable pipes for the working guys out there like me. I can’t afford those really expensive pipes out there. 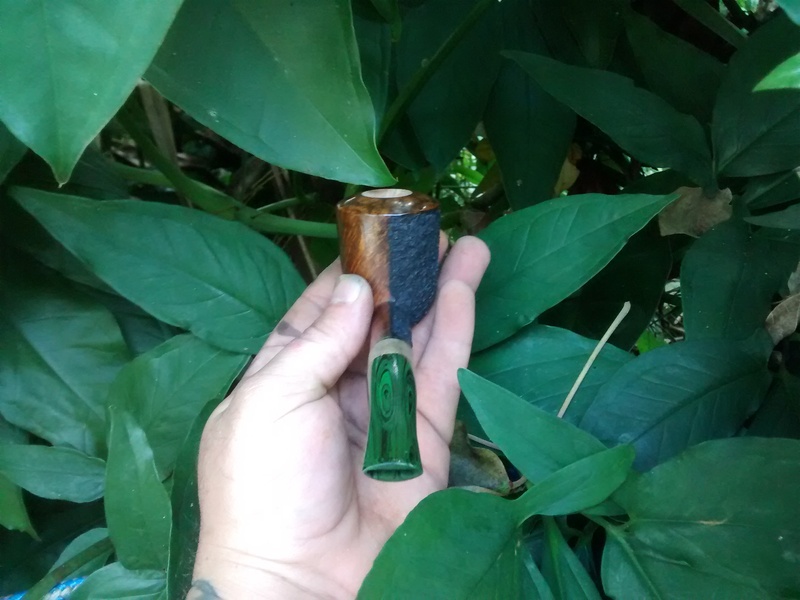 I want to give people the best pipe that I can for a reasonable price. I want everybody to be able to smoke one. 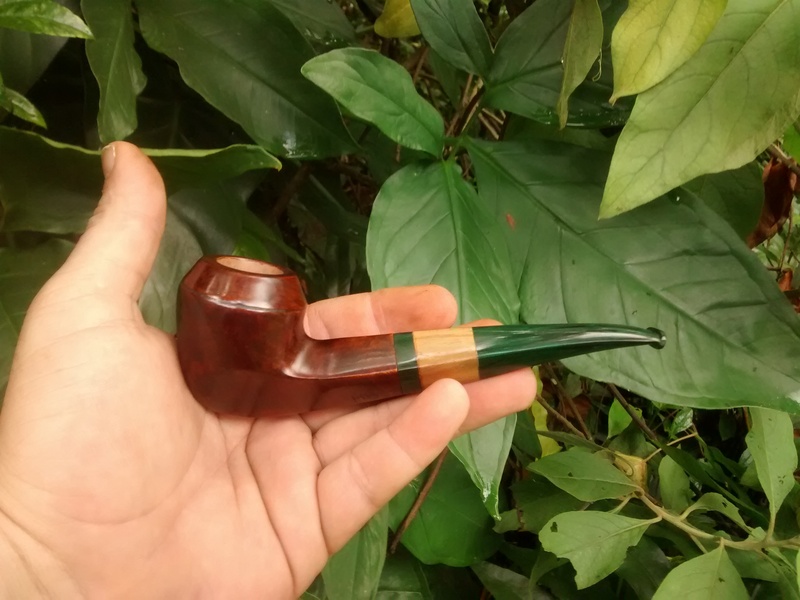 I am a guy who wants to make a truly great pipe, but I want to keep it affordable. I know that you had mentioned the Pipe Carvers Guild to me and said it was a big deal to you. Why is the Pipe Carvers Guild so important? You know, I have only been doing this for about six months. But it’s a interesting story. I got a message from Mike Miller asking me if I was interested in joining. At the time I had not, two minutes before sent Sparkys Pipes an email asking to join. So that definitely gave me a laugh! I was so stoked to have that opportunity–and still am to be honest. Some of these guys are really experienced pipe makers. They have been looking over my pipes and have been critiquing my work. I have learned so much from them, even from just the last three months. The information has been overwhelming at times. 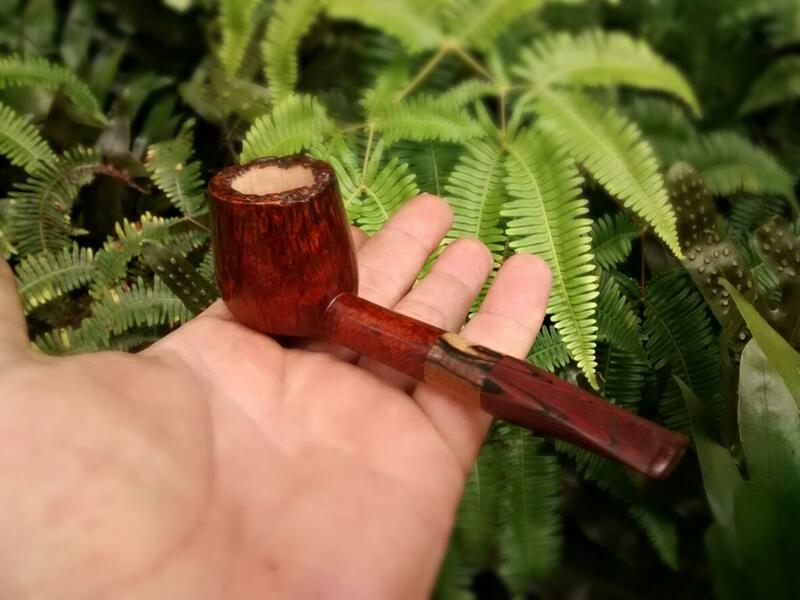 And let me tell your readers this: If you are looking to buy a handmade pipe, look for someone who is a part of the Pipe Carvers Guild. You will get the best of the best. 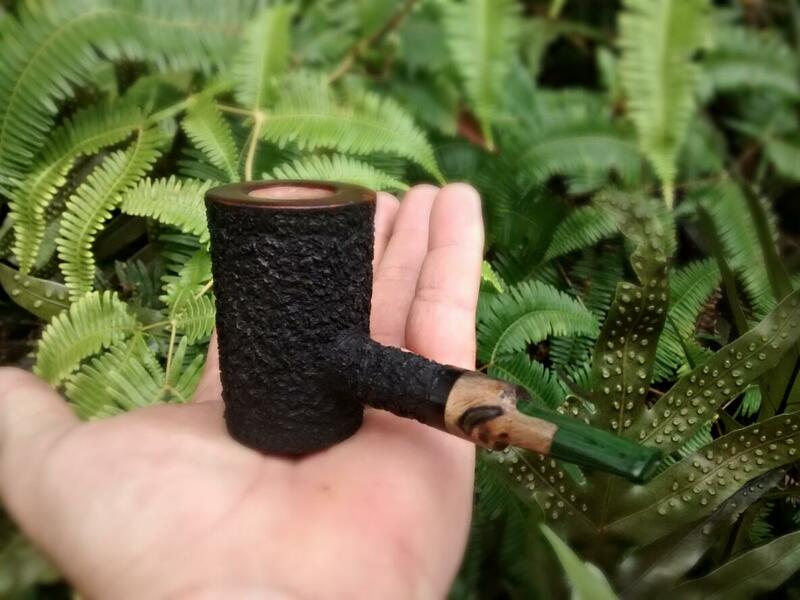 When you load up one of your pipes, where do you most love to smoke? You know, my favorite spot is just somewhere I can sit and relax for a while: my house. Smoking on public beaches in Hawaii has been outlawed, so I never get to enjoy that. Hawaii is very much an anti-smoking state. And on this side of the island where I live, we have a steady 20 mph trade wind; which definitely causes some smoking problems! We all know about smoking pipes in the wind! So at the end of the day I like to unwind, have a beer, sit in the house, and have my favorite bowl of the day. If you had to smoke one tobacco for the rest of your life what would it be? 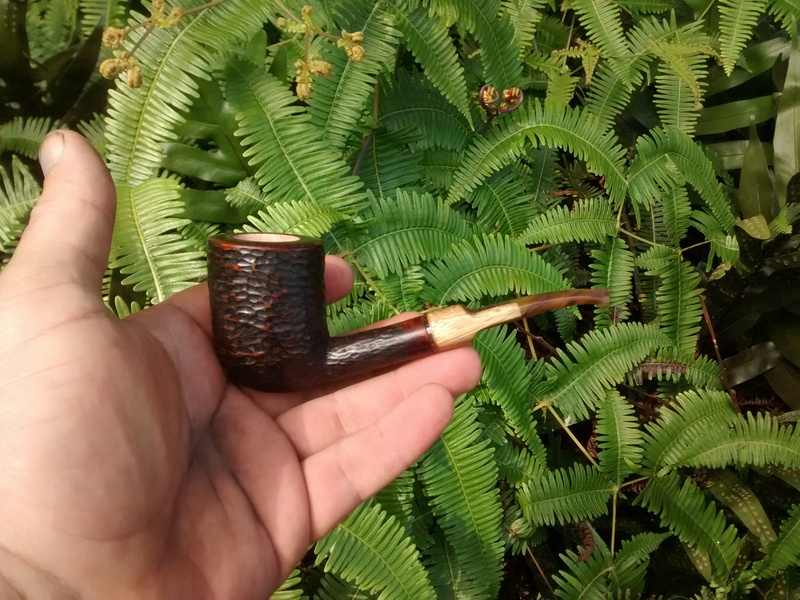 I am going to go with Samuel Gawith’s St. James Flake. I have really been into the Va/Per blends lately. It is just one of my all time favorite blends to smoke. If we want to own one of your authentic Hawaiian pipes, how can we make it happen? Right now I am on Instagram (and since our conversation, Josh has rejoined YouTube. See Hawaiian Briars). Up until this point I have made so few pipes that when I have one go up for sale it usually disappears pretty quickly. I have looked into Etsy and my own site, but I just haven’t done it yet. But I plan on seeing what the year holds. By the end of it I may be mass-producing pipes and selling them to who knows where! Josh, this has been an incredibly fun conversation. I would love to take a trip to Maui, as I am sure everyone would, to come and meet up with you. I sincerely hope our paths cross in the near future! Mahalo Chris, it’s been a blast! We’d love to have you, and definitely I hope our paths cross soon. It is with a truly sad heart that I tell you that after our conversation Josh was relieved of his duties as a professional painter. At this time Josh is focusing more of his time on carving pipes, as he should. It is my hope that this article, and other his work will elevate Josh to a level of reputation in the pipe smoking community that few have ever matched. As a man that owns one of Josh’s pipes I can firmly say that he is an INCREDIBLE artist. I can say with confidence that for the price Josh sells his pipes at, you will absolute not find a better pipe. 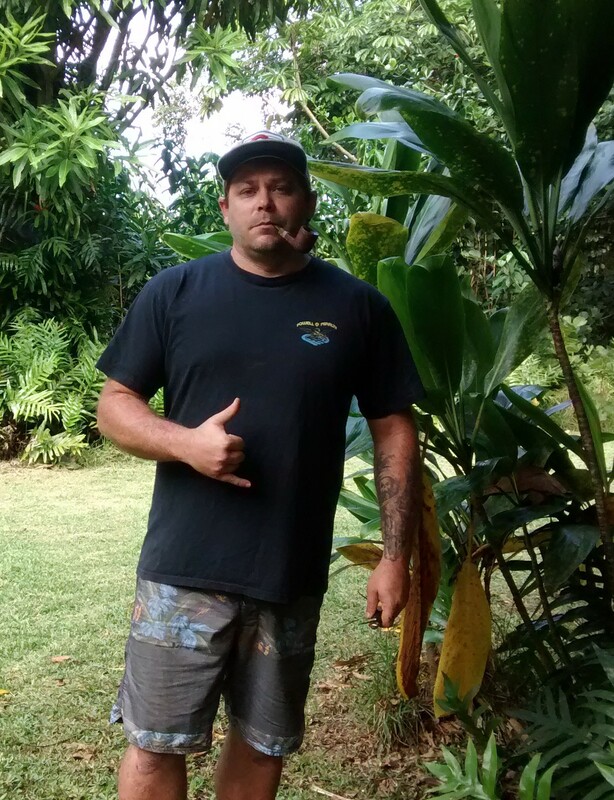 I strongly encourage all of you to check out his work and to seriously consider investing in a Hawaiian Briars next time you are in the market for a new smoker. To contact Josh about commission work message hawaiianbriars1@gmail.com. I’m over in Maui now! where is he Chris? I will ask him how to get in touch and I will give him your number. If he is fine with it I will text you his number as well. Great interview! I follow Josh on Instagram, and I enjoy seeing the pipes he posts on there. And as someone who was put out of work this year, I hope Josh is able to find a new job soon and keep on his feet.